FLINT, Mich. — As we drove through the north side of this flat, sprawling city, Monica Villarreal, the pastor at Salem Lutheran Church, pointed out landmarks. There was the Lawrence E. Moon Funeral Home, where online obituaries included a 24-year-old man who was recently gunned down in a restaurant parking lot. There was D&H, a liquor store that neighbors only half-jokingly refer to as “death and homicide.” There was the house less than half a block from the church with the porch caving in. After a conversation in her office back at Salem Lutheran, Villarreal handed me a parting gift: a plastic bottle filled with rust-colored water freshly drawn from the church’s bathroom. Water is just the newest problem in the city, said Villarreal, who grew up here. The area is low on jobs and high on violent crime. There are no grocery stores left in the neighborhood, unless you count places like D&H, and residents say the parks aren’t safe. Teenage pregnancy rates are high, and residents say drug use is a problem. “Trauma is not new to this community,” Villarreal said. Monica Villarreal, pastor at Salem Lutheran Church, talks on the phone about undocumented residents of Flint. As local, state and federal officials work to address the lead leaching into Flint’s water from corroded pipes, some experts say this is an opportunity to deal with another of the city’s tragedies: the high rates of trauma experienced by kids in the city. Poverty, violence, drug use and incarceration are all common here, and a growing body of research shows that exposure to these kinds of trauma in early childhood, while brains and bodies are developing, can have lifelong health effects. But that same research shows those negative health effects aren’t a certainty — with the right kind of support, kids can shield off the impact of exposure to trauma. Local experts believe the response to the water crisis is an opportunity to build up that resilience. That’s because some of the best known interventions for lead exposure, things like educational and behavioral support, could also work to mitigate the physiological effects of poverty and violence in Flint. Early evidence that emotional and physical trauma experienced at a young age can affect a person’s health later on came from a study conducted in California in the mid-1990s, though the theory has been around much longer. The first major paper published from the research evaluated more than 8,500 adults for what were called adverse childhood experiences, or ACEs. Researchers asked participants1 about a variety of traumatic experiences: sexual, emotional, or physical abuse or neglect as a child, as well as having a family member who is abused, struggles with addiction or mental illness, or is incarcerated. They also conducted physical exams. When the traumatic events were added up, researchers found that nearly two-thirds of the participants had experienced at least one type of trauma as a child. They also found that more childhood trauma was associated with a higher risk of a long list of health problems, including depression, heart disease and asthma. The prospective part of the study, following the participants over time, is still underway, as are studies in several other countries, including Japan, Norway, China and the United Kingdom. But the evidence of the importance of early-life events now goes way beyond just this research. An abandoned house near the Salem Lutheran Church. Along with many other researchers, the Harvard Center on the Developing Child has started to connect the biological dots between traumatic experiences and negative health outcomes. We all experience stress, but our bodies react to it in different ways. A reductive explanation goes like this: The physiological response to stress essentially kicks the body into high speed, causing an increase in heart rate and blood pressure, as well as the production of certain hormones, such as cortisol. In small or discrete doses, this response is essential to life (it helps us get out of dangerous situations, for example). But if that stress goes unchecked, scientists believe our bodies can have a toxic response, creating wear and tear on the brain’s architecture, as well as other organs, through a prolonged or intense physical reaction to the stress. Brain scans for children who have experienced a lot of trauma suggest that the neural connections in the parts of the brain responsible for reasoning and learning are weakened. That leads to problems with decision-making, impulse control and memory. Other physiological responses may lead to an increased risk of chronic diseases such as heart disease and diabetes. It also appears that these early experiences could influence gene expression, nurture influencing nature to affect how a child copes with stress, though how that process might work is not well understood. As is the case with any new scientific understanding, there are still a lot of holes in what we know, but the body of work has become foundational in medicine. It changes how doctors approach things like asthma (there is some evidence that trauma can have a synergistic effect with air pollution to increase the incidence and severity of asthma). The American Academy of Pediatrics has said screening for ACEs should be part of routine practice for pediatricians. The body of evidence on the connection has grown sufficiently that it’s challenging our understanding of not only health, but also sectors like education and criminal justice. A class-action lawsuit filed last year in Compton, California, argues that the negative impact of trauma is so well-known that schools must provide mental health counseling and other support to mitigate the effects, just as they do for other barriers to learning. The U.S. attorney general has said that ACEs are a crisis for not only public health, but also public safety and the criminal justice system. 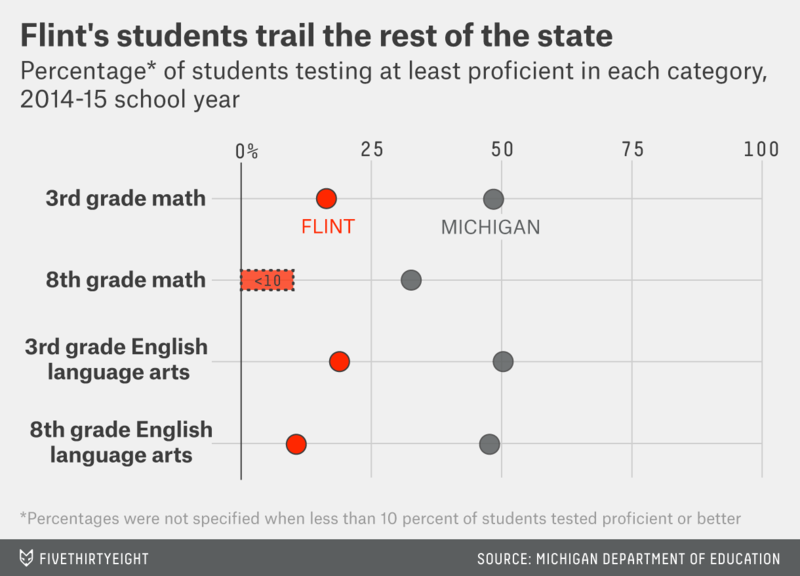 All three of these areas — education, crime and health — are troubling subjects in Flint. After a morning spent loading cases of water and filters into the trunks of residents’ cars in subzero temperatures, several volunteers from the neighborhood sat in Salem Lutheran’s cafeteria, warming up to a lunch of meaty spaghetti and green salad. Among them was Germaine Heller, a 49-year-old African-American woman wearing fur-lined ankle boots and a bob haircut under a striped knit cap. Her family has owned a house near the church since she was a year old, and her memories growing up there are fond: walking to school at nearby Garfield Elementary, playing flag football in the churchyard. But the neighborhood has changed over the years as manufacturing jobs moved abroad, leading the city into economic decline. 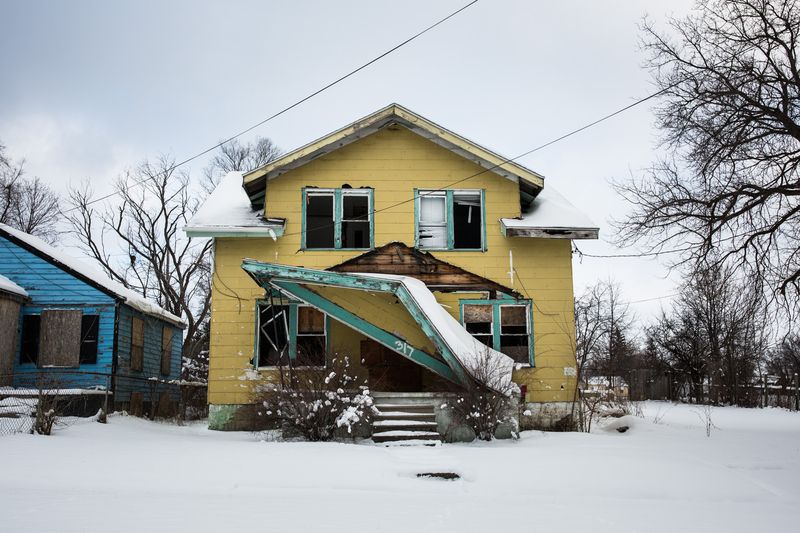 Vacant homes can be found on every block (a recent report from RealtyTrac found that Flint had the highest rate of residential vacancy in the country). A few blocks from the church, a colorful mosaic still adorns the arched entrance of Garfield Elementary, though the windows have been boarded up since it was closed in 2009 as a result of the city’s shrinking population. At Flint’s peak population in the 1960s, there were more than 45,000 students. Last year, there were 6,486, according to official state data. 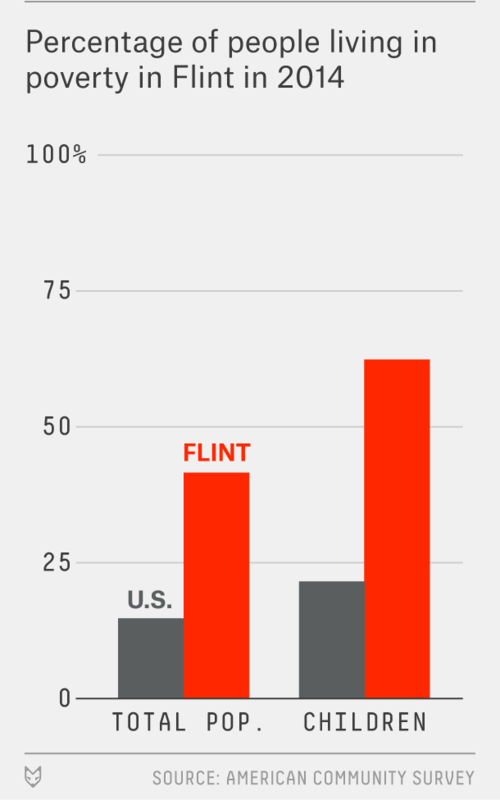 By many measures, Flint is in dire straits. About 42 percent of the city’s population lived below the federal poverty line, compared with about 15 percent nationally, and about 11 percent of people older than 25 had a bachelor’s degree in 2014, according to the census. Less than 10 percent of eighth-grade students in public schools are proficient or advanced in math, according to state standardized testing scores. 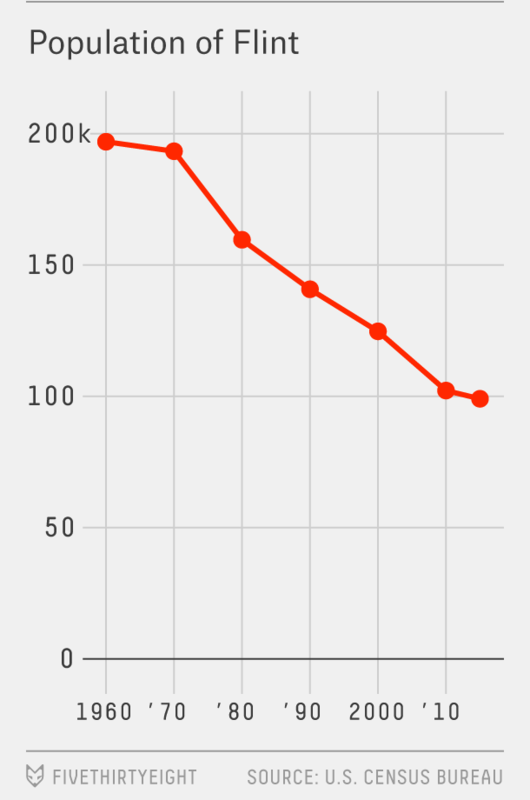 The violent crime rate was nearly five times the national average in 2014. Dr. Mona Hanna-Attisha, a pediatrician at Hurley Medical Center in Flint who helped expose the water crisis by showing an increase in blood lead levels in children, is leading many of the public health efforts to reduce the effects of the exposure. She has big plans to deal with the water crisis in a way that she hopes will also mitigate the effects of trauma. 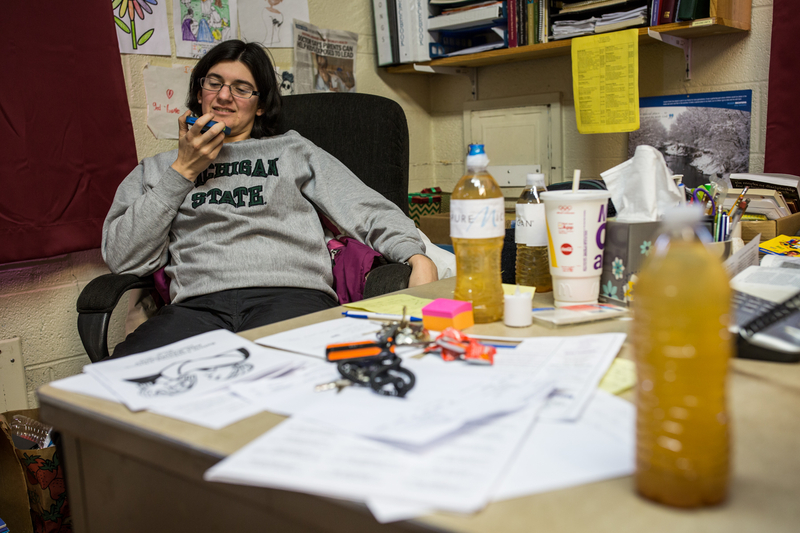 “My hope is that kids in Flint will come out of the crisis better off than they would have been if it hadn’t happened,” Hanna-Attisha said, sitting in her sun-soaked office early this year. Low-level lead exposure is treated in a couple of ways. The first is through nutrition: Some research suggests that diets high in calcium, iron and vitamin C can reduce absorption. The more amorphous, but perhaps more important, part of treating elevated blood lead levels is monitoring children’s cognitive function over the long term and providing behavioral and educational services. This latter treatment is what makes Hanna-Attisha think the city should tackle its trauma problem at the same time as the lead exposure. After the initial ACEs study, researchers wanted to understand why different people exposed to violence and instability early in life didn’t experience the same risk of negative health outcomes. Over the years, they have determined that people vary in their resilience, or ability to deal with traumatic events. Although some of that difference is certainly genetic, researchers at the Harvard Center on the Developing Child say that the single most important factor is having at least one healthy relationship with a supportive adult. Heller remembers that when she unexpectedly got pregnant at age 21, her grandmother offered her encouragement and helped pull her out of a deep depression she says she sunk into because she felt unprepared to raise a child. With her grandmother’s help, Heller says, she was able to give her only son a great childhood. At 28, he has a job and a wife and lives in a Flint suburb. Hanna-Attisha thinks encouraging the development of these relationships and other protective factors should be part of the response to the lead crisis. Both exposures are known to set back a kid’s development. Hanna-Attisha has started building a database of kids with potential exposure, and through a fund set up to help pay for various treatments, as well as a Medicaid waiver that will allow the state to provide expanded services, plans to get them a host of services. For starters, she wants to build up the city’s Head Start program, so kids can build relationships with teachers who are trained in cognitive development. She wants the Flint school district, which currently has one nurse for all of its schools, to hire more people to work on physical and mental health with kids. Her team recently released a cookbook and started hosting cooking classes at the city’s sprawling farmers market. She also is looking into ways to help build healthy home environments. Although interventions earlier in a child’s life seem to work best, the Harvard researchers say it’s never too late to build resilience. It can be done at any age. Heller says she’s seen the water crisis bring the community closer together than it had been in a long time. “Just maybe, the lead might be a bad thing that leads to something else,” she said. She offered an example: A couple of years ago, she had a falling-out with a neighbor she’d been friends with all her life, and they hadn’t spoken since. When the neighbor pulled up to the church in search of water, Heller opened the door to ask whether she wanted the bottles in the back seat or the trunk. The woman eyed her sheepishly, but then asked how she was doing and thanked her for her help. One of the limitations of the initial ACE study and subsequent studies is that they rely on self-reporting, leaving them open to bias, especially when it comes to reporting adverse events from childhood. However, as the ACEs study showed, the incidence of adverse events, things like having a parent with alcohol addiction, or domestic abuse, parallel the incidence from other surveys and data sets. Follow-up studies have been able to explore this relationship more directly.